Having basic electronics info with you at your electronics workbench in the UK can be invaluable. Tear out and pin up these calculations, values, symbols, abbreviations, measurements and markings, and you’ll always have the essentials at hand. These equations, using Ohm’s Law and Joule’s Law, are the most useful you’ll find in electronics. They come in handy all the time for checking what’s going on in your circuits. Use this table to decipher the colour code on your resistors and capacitors. Distinguishing some colours from others can be tricky, so examine small parts really closely – perhaps with a magnifying glass and always under good light. Capacitor ratings aren’t all that precise, but you can at least work out how imprecise the ratings are by deciphering the following letter tolerance codes. The first two digits of a capacitor value reference give you a number that you then divide or multiply by factors of ten according to the value of the third digit. 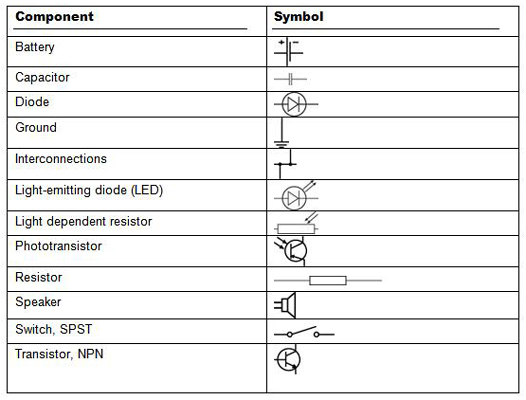 This table shows you the electrical and electronic component symbols used in the UK. The US and other countries use their own symbols for some components, such as resistors and capacitors. This table lists the abbreviations for some standard international units named after famous scientists and engineers. The symbol for the ohm is the upper case omega, which is the last letter of the Greek alphabet. These units of measure are used in many different areas, not just electronics. Note that in science and engineering, though, an upper case ‘M’ represents a million and a lower case ‘m’ represents a millionth.